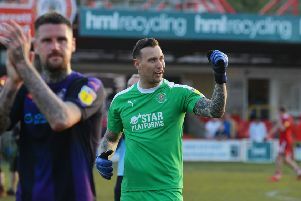 Hatters goalkeeping coach Kevin Dearden insists that young stopper Harry Isted should look to try and win a place in the first team after agreeing a new contract last week. The 21-year-old is yet to play a competitive game for the club after arriving last summer, following his release by then-Premier League outfit Stoke City. He’s got a tough job on his hands, because he’s got to try and displace one of either Marek or James, but I told him that’s got to be his aim. He has played in a number of development matches, while also having a spell out on loan too, but now Dearden wants him to set his sights on breaking into manager Nathan Jones’ thoughts. He said: “He’s not had chance to play too many games, apart from development matches, but he went out on loan to Chesham United last season and did really well there. “Unfortunately he got injured so didn’t end up staying until the end of the season as planned, but he’d had a good spell and helped them up the table with some excellent results. “I had a chat with him at the end of last season and he’s got a tough job on his hands, because he’s got to try and displace one of either Marek or James, but I told him that’s got to be his aim. He continued: “If we don’t think that he’s going to usurp Sheasy or Marek straightaway, then we need to help him and get him playing on loan again, as high as possible. Luton had exercised their option to extend Isted’s deal by another year at the end of the promotion-winning campaign. However, he then penned improved terms last week, as on his progress so far, Dearden said: “Harry’s been doing very well and deserves his new contract. “He’s been great to work with from the moment he came in on trial last summer. “We needed someone to complete the group and Harry did well in pre-season. “We saw something in him that we felt we could work with, and I think he’s made real good progress over the season.